Seems to help, I know, downtown"
I grew up in the tiny Danish-style town of Solvang situated in the Central Coast of California. The bucolic countryside surrounding the town is predominately owned by ranchers and farmers. The wine industry has grown considerably since I moved away and the Santa Ynez Valley has become a preeminent destination for wine aficionados, especially after the film Sideways became an unexpected box office success in 2004. During my childhood, all I wanted to do was escape the valley and move somewhere else. "Else" as in a city, a place where not everyone knows your name and the citizens are not involved in your day to day life. I desperately wanted anonymity and to experience a sense of adventure, both which seemed to me, were not readily available in that beautiful but claustrophobic little town. Now you may be prone to jump ahead and think that this is when I will henceforth recall how I naïvely marched into the big world and experienced first hand the plights of living in a cold unforgiving city, learning through hard won wisdom to appreciate the simple comforts of small town life. Not so much. I may like to visit a small town to feel my country roots, but I'm definitely a city girl. The cities I have chosen to live in seem to be those with suburban sprawl and I'm always in a house located away from downtown. Therefore, owning a car is not optional. I have always wondered what it would be like to live in an urban environment where the coffee shop and the corner store are within walking distance and public transportation is my new normal. I love going walkabout in cities such as San Francisco, Salt Lake City, Memphis, Boise and Vancouver BC, to name a few. Something is always happening downtown and there always seems to be an abundance of photo opportunities. I'm also content to sit in an outdoor cafe and watch the people go by, bustling about their business. My mother and father moved to Denver for a six month stint when my sisters, Linda and Juliette were very young. My mother loves to reminisce about the schizophrenic weather she endured living in Denver for that brief time. It was not unusual to experience four seasons in one day and snow in June. It's true— the weather is wacky in the mile high city. I got a taste of the ever changing weather conditions during my two visits to Denver this year. Over the course of one week in early June, we experienced sun, rain, hail, and a tornado warning. The ever changing weather patterns were hard to predict. It could be sunny in the morning — absolutely beautiful weather — followed by a torrential downpour in the afternoon. If you visit Denver, my advice is to carry an umbrella with you... at all times! The one day we didn't have our umbrellas with us was the afternoon we got caught in a heavy rain. My daughter, Maddie was positively soaked from head to toe. With regards to my professional life, it turns out that Denver is a popular city for conferences this year (thank goodness because Las Vegas has worn thin on me). Back in April, I learned that in June I would be attending XeroCon, an accounting conference. Since my daughter would be a recent high school graduate, she would be free as a bird to travel with me. Maddie and I were excited to stay with our former neighbors and close friends who moved to Colorado a couple of years ago. I had the pleasure of visiting Stephanie, Michael and their two girls earlier in the year when I was in town for a mining conference. In February, Stephanie and I had a blast exploring Castle Rock and walking among the spectacular red rocks of The Garden of the Gods in Colorado Springs. This visit, we had planned to attend the First Friday Street Fair in the city of Golden, weather permitting. It didn't. The mercurial weather turned nasty and dashed our plans. We amiably switched to "Plan B" and opted for dining at the charming The Old Stone Church, followed by enjoying a movie at the local cineplex. The next day, Stephanie read that there was a Chalk Art Festival in downtown Denver. 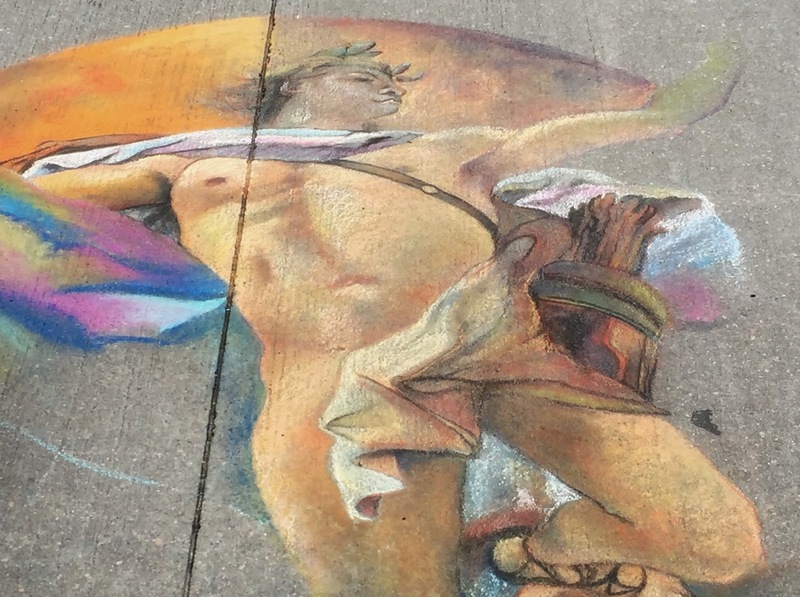 I was excited to attend, recalling Linda's blog post covering Italian Street Painting Marin that takes place bi-annually in San Rafael, California. Maddie was determined to see downtown Denver for the first time so we all planned to attend the chalk art festival rain or shine. we received a personalized poem as a travel keepsake. Saturday morning, Michael found parking in a small lot near the event. We proceeded to go walkabout before heading towards the chalk art festival. We stopped by the Tattered Cover Book Store to browse the titles in the large cavernous space that overfloweth with character. As part of my ongoing commitment to support independent book sellers, I purchased a copy of Tom Robbins' new book, Tibetan Peach Pie. Afterwards, we proceeded on to Union Station and admired the beautifully remodeled interior. When I tour a downtown area, I always make sure to have some dollar bills handy in a pocket. I enjoy supporting local artists, those talented souls who sing while playing an instrument, or the writers of prose who are willing to compose and recite — with feeling, I might add — a spur of the moment poem. Magicians and mimes are also favorite performers of mine. Not long after our visit to Denver, Maddie and I traveled together to New Orleans and our time there would not have been the same without interacting with the local performance artists, musicians and painters. As for the talented chalk artists... well, as you can see from the photos above, the drawings were amazing. We wandered around and watched artists create for the sake of creating. The crazy Denver weather would surely wash the drawings away within a short period of time, even if the artists were using a special formulation that could withstand the elements longer than normal chalk. Sure enough, as we wrapped our day and headed to the car, light sprinkles of rain descended from the sky. I kept my fingers crossed that the artists would be able to finish their designs and that the crowds could linger until dark to admire the art and to hopefully appreciate all the fine things that cities have to offer. A perfect Sunday breakfast that we enjoyed at Michael and Stephanie's. Stephanie's husband, Michael is an exceptional cook. Michael's father was a Chef and he opened restaurants around the globe. Michael is quite comfortable in the kitchen while preparing any meal of the day. 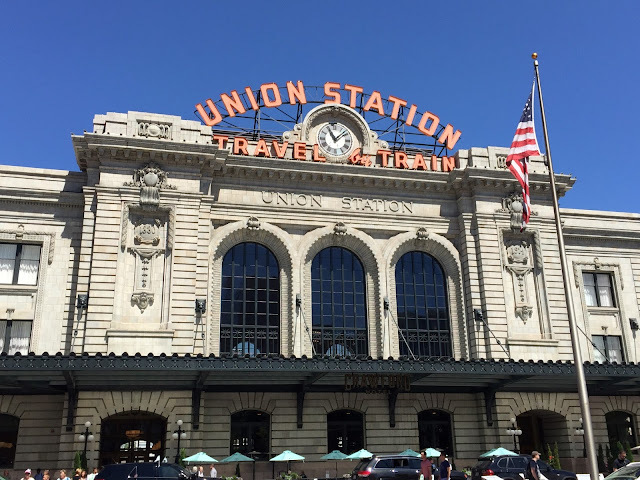 When we went walkabout in downtown Denver, Michael led our merry band of sightseers to a crêpe cafe for an afternoon snack. What the kitchen produced looked more like a thin pancake than a proper crêpe. I'm the type of person when I am unsatisfied with a meal at a restaurant, I have to make the offending item at home to move on from the lackluster experience. Michael, it seems, is similarly minded. After we returned home from a full day of traipsing around downtown Denver, Michael didn't flop on the couch, but instead began working in the kitchen. Curious, I asked him what he was making. Turns out, he was whipping up crêpe batter that once finished, would rest in the refrigerator overnight and be ready to use in the morning. It's always great to have something to look forward to, especially an elegant family breakfast. On Sunday morning while Stephanie made lattes for us and then prepped berries, peaches and whipped cream, Michael busily turned out beautiful crêpes that looked and tasted nothing like the thin pancakes from the previous day. Michael also fried bacon and then basted eggs in the bacon fat. So delicious! After devouring breakfast, I knew I'd want to make the crêpes in my own kitchen. I asked, with a little trepidation, if the crêpes were a family secret and if Michael would be open to sharing the recipe with me. Michael crossed the kitchen and returned with a cookbook that he handed to me to read. I was stoked! The recipe, it turns out, is from Crêpes: Sweet and Savory Recipes for the Home Cook by Lou Seibert Pappas. As a lovely surprise, Maddie purchased the cookbook for me as a gift after we returned home from Denver. Michael prefers Cointreau or Grand Marnier in his mix, which tasted wonderful with the fresh fruit filling. For a gluten-free option, the author suggests replacing the all-purpose flour with cornstarch and add 1/8 tsp baking soda. For savory crêpes omit the sugar and vanilla extract. Swap vodka for the liqueur. Additional butter for cooking the crêpes. 1. In a blender or food processor, blend until smooth: the eggs, milk, water, flour, sugar, vanilla, liqueur, and melted butter. With a rubber spatula, sweep the sides and stir down the mixture and blend again. Cover and refrigerate for a minimum of 2 hours or ups to 24 hours. 2. Gently stir the batter if it has separated. Heat a seasoned 6, 7, 9 or 10-inch nonstick crêpe pan over medium-high heat until hot. Wipe the pan lightly with butter, lift the pan from the heat and pour in 2 to 3 tablespoons of batter for a 6- or 7-inch crêpe or about 4 Tbsps (1/4 cup) for a 9- or 10-inch crêpe. Immediately tilt and rotate the pan to coat the surface with the batter. Cook until almost dry on top and lightly browned on the edges, about 1 minute. Loosen the edges with a spatula and flip the crêpe over using your fingers or the spatula, then cook the other side for about 15 seconds, or until lightly browned. Turn the crêpe out onto a clean tea towel to cool. Repeat with the remaining batter, wiping the pan with butter as needed and stacking the crêpes as they are cooked. 3. For serving immediately, cover the crêpes with aluminum foil and keep them warm in a preheated 200°F oven. For serving later, wrap them in plastic wrap in quantities intended for each use and slip them into a self-sealing plastic bag. Refrigerate the crêpes for up to 3 days, or freeze for up to 2 months. Yield: 16-18 smaller crêpes or 10-12 larger crêpes. The main hall at Los Angeles event venues leads to the outdoor patio which was similar to a club/lounge on the westside of town – however, the outdoor linen covered patio couches gave it more of an intimate feel.